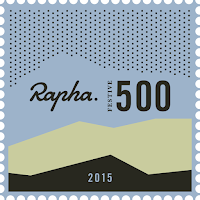 You are probably wondering why I am writing about Velo Junkie’s adventure instead of my own. 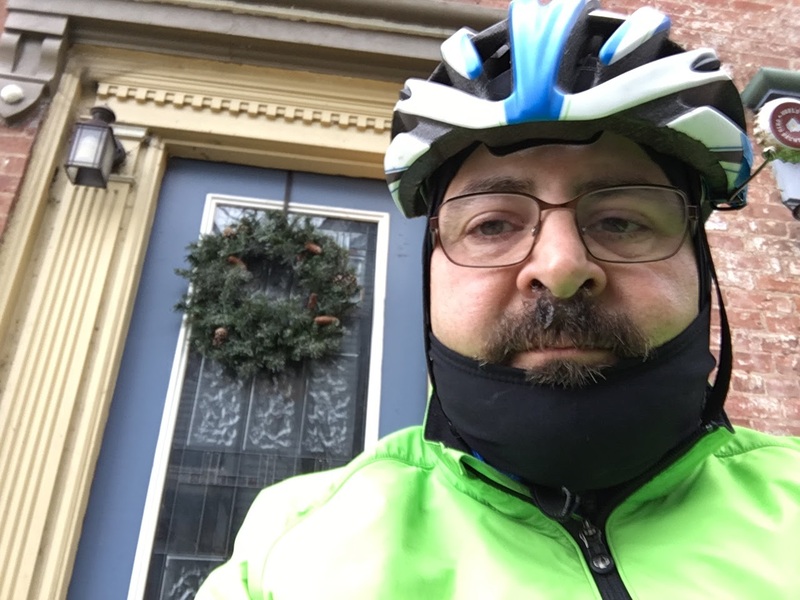 Well, While Velo was out gallivanting around southwest Ohio on two wheels, the Reluctant Cyclist had a very long list of other challenges that had an end date of December 31rst. I want to share this year-end ordeal because I am very proud and a little envious of his determination. 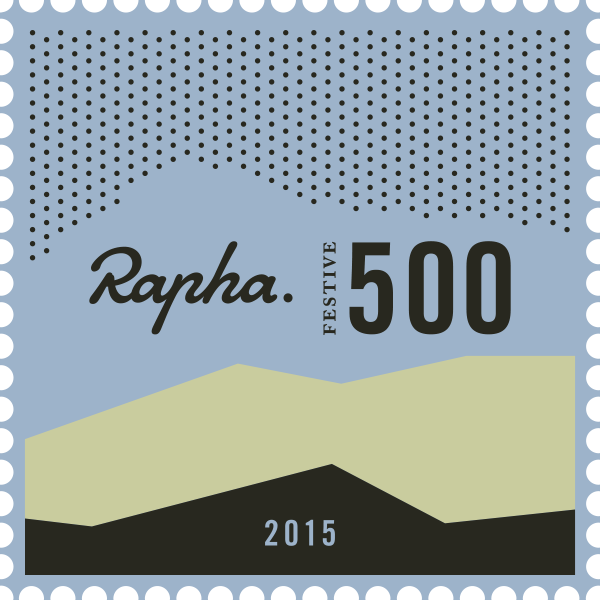 The Rapha Festive 500 is an annual challenge to ride your bike 500 km over the days between Christmas Eve and New Year’s Eve. I probably would never commit to the challenge even if I didn’t have a son and a daughter who were both in a New Year’s Eve wedding. Maybe I worry too much, but I guess that is what mom’s do. 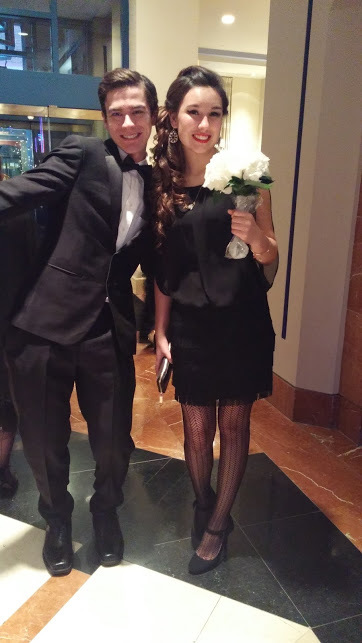 I was determined to make sure my kids were on time for every scheduled event, had the proper attire and accessories, and looked absolutely stunning when the time came. If we compare notes from the week it’s obvious why I couldn’t complete the challenge even if I had wanted to. 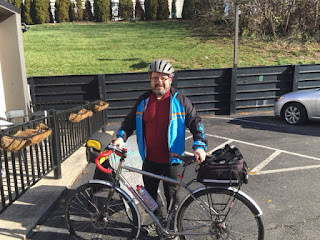 Since this is a cycling blog I thought I would interview Velo for details about his adventure. Forgive me if I interject some of my excitement from the week. 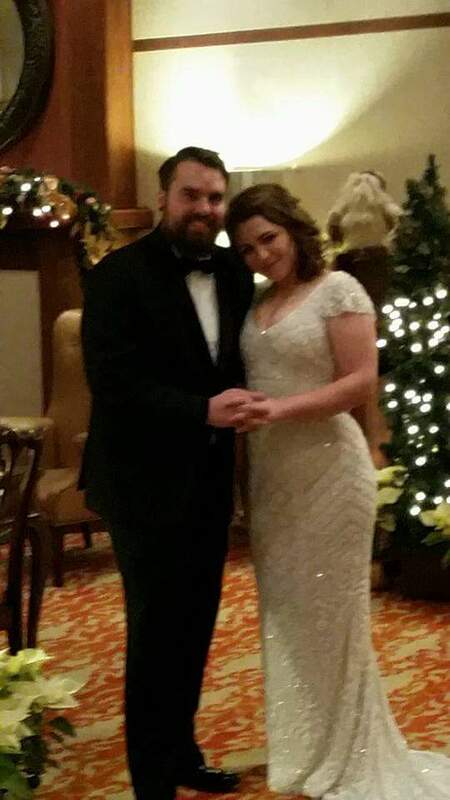 It’s not every day your niece gets married on New Year’s Eve and both of your kids are in the wedding party. Thursday morning I got up and went through my normal routine because I was not off of work. It was Christmas Eve, day one of Velo’s challenge. He was excited because the day was going to be unusually warm for this time of year. 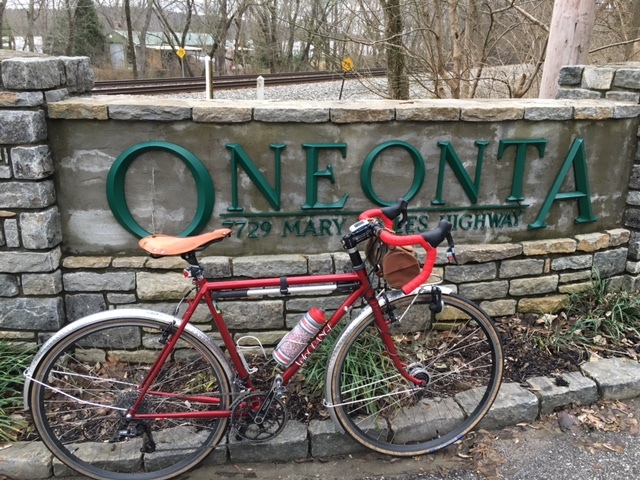 A balmy 60 degrees, the sun shining, he waited till about 11 a.m. to hit the open road. Traffic was light, and, in hindsight, he wishes he would have covered more ground that day. The weather got progressively worse as the week went on. A family dinner for Christmas Eve created and unfortunate constraint for his Christmas Eve endeavor. Being such a thoughtful person, he mailed Christmas cards at the post office (better late than never, right?) and delivered a bottle of champagne to me at the office. After missing me at work (I had to run a wedding errand) he backtracked to the east side of town and to Starbucks for his holiday fave, a Cranberry Bliss Bar. Christmas Day found us alone for most of the day so we took advantage of it and went for a ride together. See my previous post, “A Pluvious Christmas Ride” for details about our Waffle House expedition. Saturday, December 26th was still unseasonably warm but a little on the wet side. Velo headed out for a ride about the same time I left to pick up my daughter. She was inviting her boyfriend over to meet us and wanted to make dinner so we had to go grocery shopping. 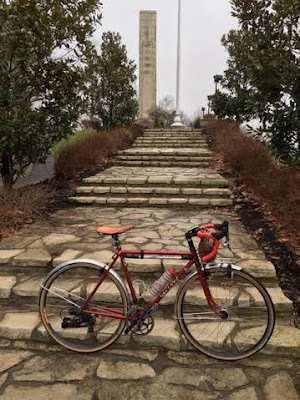 Velo managed a 37 mile ride to Harrison’s Tomb in Cleves, OH. This was the day he was out longer than I had expected so I sent a desperate text to find out where he was and if he was still upright. Low and behold, wind and rain had slowed him down and a flat tire on the way home hindered his timing. Changing a flat tire in the rain on a December morning is not a fun thing. In addition Velo had planned to take his Mom out for Christmas lunch and shopping and to visit with his brother and Family 60 miles away. Sunday, December 27th was better suited for a canoe than a bicycle. 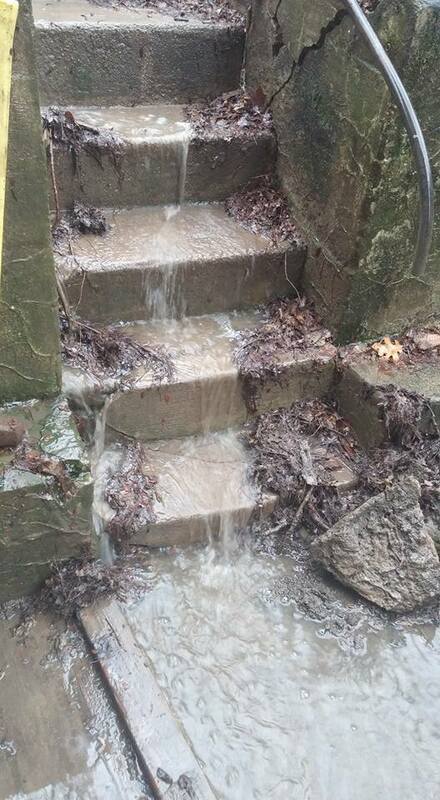 We woke to water running in the back door so excavation of the yard pre-empted a ride. Monday, December 28th and Velo was diligently back at the challenge. The temperature was still on the warm side but that bonus was negated by the pouring rain. 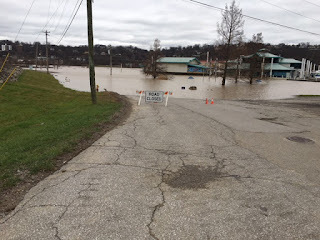 After traveling east and hoping to do a few laps of the Lunken Airport loop, he quickly realized all the water was flooding surrounding creeks and streams so he had to detour around the park only to find high water on Eastern Ave.
On his way back he had an appointment with a leather craftperson, J.Wan, at Carabello Coffee to discuss a Christmas project I had ordered for him. Though the rain was not as severe as Sunday, poor Velo returned from running errands with just 42 miles completed looking like someone had put him through a rinse cycle. Five of the eight days had passed and he was less than halfway through the challenge with weakening forecasts for the remainder of the week. Tuesday, December 29th was still warm but very windy. With the time-clock ticking Velo knew completing the challenge was against the odds. Additionally, we had family in from out of town and were meeting them for dinner at 5 o’clock. I had to go to work at 9 a.m. and Velo left on his bike at the same time. 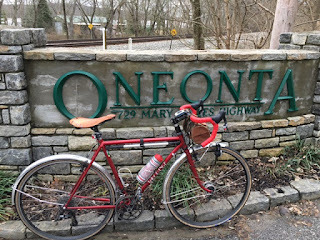 His goal for the day was at least 60 miles, which he exceeded by riding to Oneonta, KY. Yep – that’s exactly what I said, “where the heck is Oneonta?” Given the strong winds he decided to take Route 8 east along the KY side of the river. The road was flooded at Manhattan Beach Marina and the main building was partially underwater. Wednesday, December 30th, Velo knew he had to make this day count. The wedding rehearsal and dinner was scheduled for 6 p.m. and I had volunteered him to be in charge of the music during the wedding ceremony so he had to be on time. He left in the morning at the same time that I was leaving for work again. The temperature hovered around 50 degrees but at least the precipitation had ceased. His 69 mile ride took him east then north to the Warren County line, where the Butterworth Estate is marked as a notable stop on the Underground Railroad. On the return trip he stopped at the Branch Hill Coffee Company in Loveland to refuel. Last day, New Year’s Eve, with the wedding looming, Velo needed about 40 more miles to complete the challenge. To his dismay the temperature dropped significantly with the high of only 35 degrees. 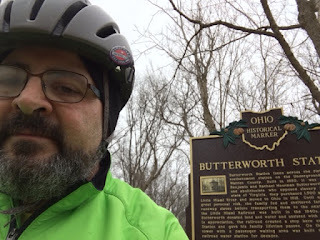 He chose a route to Cleves, back out by Harrison’s Tomb, and a familiar weekly loop we do in the summer to Shawnee Park. On the way west he was treated to a cold wind and a bit of sleet. I think he had a fleeting moment of doubt some time during this ride. On the way home he stopped for coffee and breakfast at the McDonald's in Sayler Park. All while I was tending to my daughter’s schedule as a bridesmaid, having mimosa’s with my sister and shopping downtown. 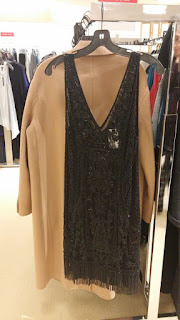 I scored a dress at Saks Fifth Ave. for my daughter-in-law. 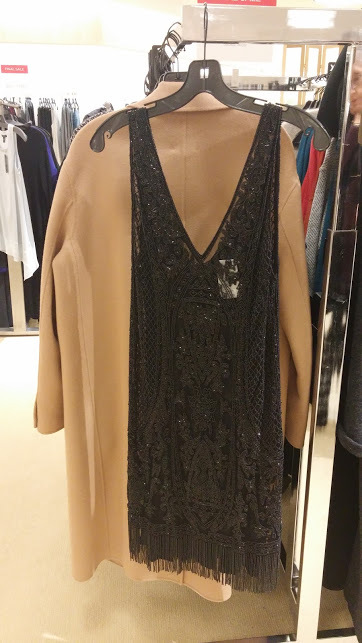 A $1,000 beauty on the 70% off rack. The theme of the wedding was Roaring 20’s so fringe and beads were all the fashion. And now, please join me in congratulating Velo Junkie on his achievement and Scott and Marita(Hergert) Sullivan on their new life together.